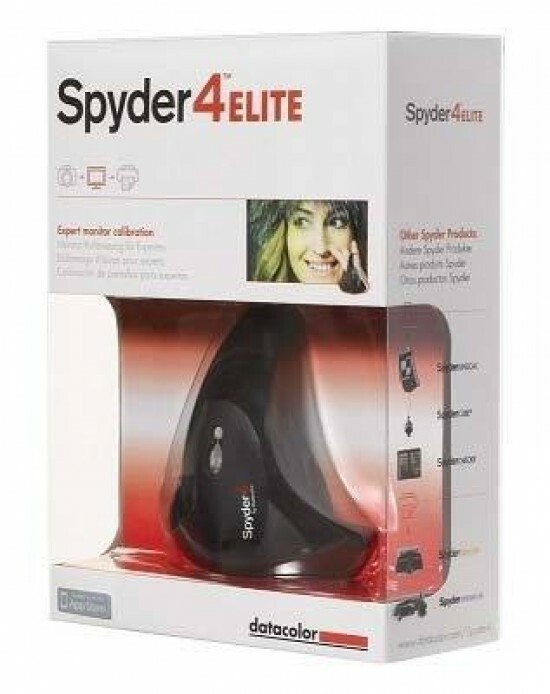 The Spyder4Elite is the top of the range colour calibration device from Datacolor. Priced at $249, the Spyder4Elite can be used to calibrate monitors, laptops, projectors, TVs, iPads and even iPhones and it offers the highest level of user customisation out of the three available models. Developed for professional photographers, videographers and others who must match colors precisely, Spyder4 delivers an average of 26% more accuracy and improved low-luminance performance over the previous Spyder3 technology. One of the most overlooked elements to creating a quality digital image is color accuracy. Yes, you can tweak the image until the sky is that perfect hue of blue, or the skin tones have just the right amount of warmth and vibrancy. When it's all done, the image is posted online or printed and suddenly it looks like you did all the image correction in the dark. The image is too dark, skin tones are too red, any number of problems. Where did it all go wrong? 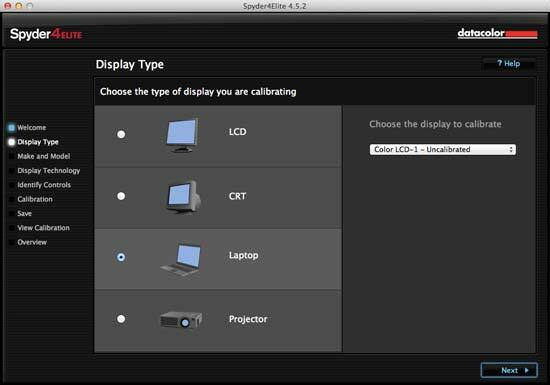 In almost all cases, it's a lack of having a calibrated display that is causing the issues. Back when CRT displays were the common screen type, color could be wildly different and it was usually pretty easy to detect when the display was at fault. With modern LCD displays, that isn't necessarily the case though - color is often close to correct in hue, but luminance, or brightness, is a common issue. Most LCD displays are very bright when used at the default out-of-the-box settings. Everybody like a vibrant and bright display, it catches the eye, but as photographers, we need to be more interested in what is accurate, not some artificial ideal of color. Particularly if you print your own images, having a realistic brightness on screen will save a great deal of work, ink, paper, and hair from being pulled out. Both Windows and Macintosh have the ability to be calibrated visually, and while this is certainly better than nothing, there is too much random chance involved with a visual calibration. Your eyes perceive color differently from one minute to the next, and this can translate into inconsistent results. This is where a hardware calibration device, such as the Datacolor Spyder4Elite comes into play. 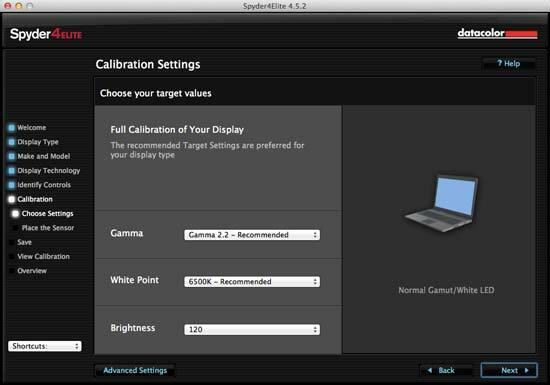 Comprised of a software package that drives the calibration device, and the device itself, monitor calibration is a tool that should be in every serious photographer's kit. There are two common types of measurement devices - spectrophotometers and colorimeters. The Spyder devices fall into this second category. Working by measuring the color values flashed on your screen, the Spyder uses a 7 color sensor that works on a variety of devices - everything from projectors to iPads, and of course LCD, LED, CRT and other displays that you would use with your digital editing. The Spyder is available in three flavors. The Express, at $119, the Pro at $169, and the Elite at $249. The hardware in all three packages is identical, but the software capabilities expand greatly depending on the version you have. For basic use, with a single display and minimal interaction required, the Express is a great option and will give you much more accurate color than previously seen. For those of us that use multiple displays, and have the need to go beyond what the basic choices offer, including being able to fine tune the gray balance, or work with an expert mode for total control, the Elite is an excellent choice. In any case, the process is similar. 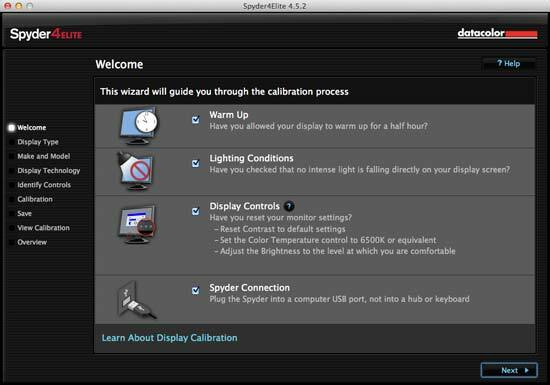 You'll begin by starting the software, and when prompted, place the Spyder on your display. Over a period of about 5 minutes, the display will flash a range of colors in red, green, blue, blacks, and whites. These colors are of specific values. The software reads the numbers coming back from the Spyder and determines how much difference there is between the ideal and the actual measured value. Once this is complete, a profile is created for your display.